Vetri-Probiotic BD is designed to soothe the digestive tract lining and provide ingredients that support proper immune function and microbial balance. 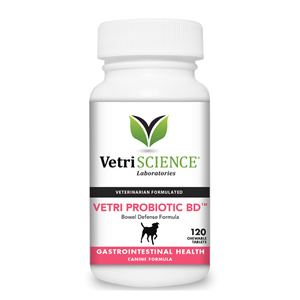 Vetri-Probiotic BD helps dogs with gastrointestinal disorders, allergies and other food sensitivities. This formula combines probiotics, digestive enzymes, l-glutamine and other nutrients to support the proper structure of the G.I. tract in dogs whose digestive and bowel functions are affected by food sensitivities or infiltration of unwanted bacteria. Vetri-Probiotics BD is designed to soothe the digestive tract lining and provide ingredients that support proper immune function and microbial balance. Vetri-Probiotic BD is for dogs only. Each bottle contains 120 chewable tablets. This has really helped my old boy's stomach. Great product at a great price. I won't buy it anywhere else. Both my dogs love the taste and it helps digest there food great. Love this brand. N-Acetyl Glucosamine supports the integrity of the mucosal lining and has been used to treat IBD, ulcerative colitis and Crohn's Disease. N-Acetyl glucosamine is derived from the outer shells of shellfish. Pets (and people) with shellfish allergies are allergic to the meat of shellfish, not the shell and so N-Acetyl Glucosamine will not cause an allergic reaction. FOS is a prebiotic that supports the growth of lactic acid bacteria (beneficial bacteria) and reduces intestinal stress. L-Glutamine is an amino acid which serves as a source of fuel for cells lining the intestinal tract. It is often recommended for pets with diarrhea and chronic inflammatory bowel disorders. Arabinogalactan Powder supports the immune system and regularity. Alfalfa is rich in nutrients including calcium, magnesium, potassium and beta carotene. It is regarded as an effective diuretic, helping to prevent bloating and assisting in the removal of toxins from the body. Alfalfa also helps to ensure regular bowel movements. Probiotic Blend to support normal intestinal flora. Saccharomyces is a beneficial yeast that acts as a probiotic. Probiotics help restore healthy gut flora. In numerous clinical studies, Saccharomyces Boulardii was found to significantly reduce the symptoms and frequency of acute diarrhea and diarrhea related to colitis, inflammatory bowel disease and irritable bowel syndrome as well as antiobiotic-associated diarrhea. Ginger helps to settle the stomach by boosting digestive fluids and neutralizes acids. Modern research confirms its effectiveness in relieving the symptoms of nausea, vomiting, indigestion and flatulence. Ginger has strong anti-inflammatory and pain relieving properties and is used to treat inflammatory diseases. Lipase is a digestive enzymes that breaks down fat. 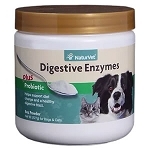 A digestive enzyme that breaks down carbohydrates. Pepsin is a digestive enzymes (protease) that breaks down proteins. Bromelain is a group of protease enzymes found in pineapples and helps to break down proteins. Papain is a protease enzyme found in papaya and helps to break down proteins. Inactive Ingredients: brewers yeast, chicken liver flavor, stearic acid, silicon dioxide. Dogs under 12 lbs: 1 tablet daily. Dogs: 2 tablets per 25 lbs of body weight, daily. Dogs under 12 lbs: 1/2 tablet daily. Dogs: 1 tablet per 25 lbs of body weight, daily. Vetri-Probiotic BD™ is a highly palatable chewable chicken liver flavored tablet. Vetri-Probiotic BD is intended for use in dogs only. It contains a compound from alfalfa that cannot be detoxified in the liver of cats. 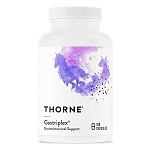 Gastriplex by Thorne Research is an excellent digestive support formula that can be used in dogs and cats.